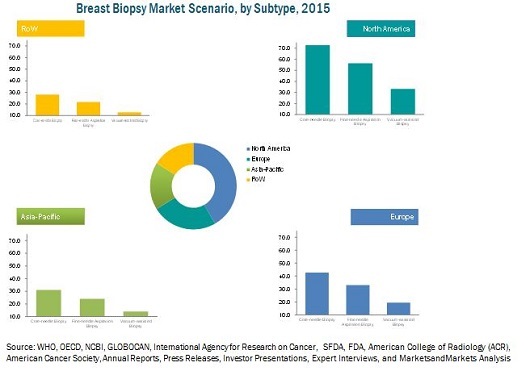 The global breast biopsy market is poised to reach $728.8 Million by 2020 from $436.4 Million in 2015, at a CAGR of 10.8% from 2015 to 2020. In this report, the global market is segmented on the basis of product, type, guidance, and regions. Based on type, the market is categorized into needle breast biopsy (NBB) and open surgical breast biopsy (OSBB). The NBB is further subsegmented into core needle biopsy (CNB), fine needle aspiration biopsy (FNAB), and vacuum-assisted biopsy (VAB). Among these, VAB is expected to be fastest-growing segment owing to the growing demand for less-invasive breast biopsy procedures worldwide. OSBB is further segmented into excisional and incisional breast biopsy. On the basis of guidance, the market is divided into mammography, ultrasound, MRI, and others (PET and thermography). In this market, the ultrasound segment is expected to be fastest growing, owing to the increasing demand for minimally invasive and non-radiation breast biopsy among patients and surgeons. The growth of the market is propelled by increased reimbursement rates in the U.S. for image-guided biopsy approach, the rising incidence of breast cancer among women, growing breast cancer screening programs in different countries, and the increasing demand for less-invasive breast biopsies. However, the risk of infection due to improper care of breast biopsy cuts and wounds and uncertain regulatory guidelines for medical devices are likely to limit the growth of the market. Key players operating in the market are Becton, Dickinson and Company (U.S.), C.R. Bard, Inc. (U.S.), Devicor Medical Products Inc. (U.S.), and Hologic Inc. (U.S.). This report covers the global and regional market for breast biopsy on the basis of products, types, and guidance. Major factors fueling market growth are the rising incidences of breast cancer among women and increase in breast cancer screening programs in different countries. In addition to this, the increase in reimbursement rates in U.S. for image-guided biopsy and the growing demand for less-invasive breast biopsy are propelling the growth of the market. On the basis of type, the market is classified into needle and open surgical breast biopsy. The needle breast biopsy segment is expected to account for the largest share of the market, because of the increased preferences for needle biopsies over open surgical breast biopsies and the demand for scar-less and painless surgical procedures. The market is segmented on the basis of product, type, guidance, and region. The breast biopsy guidance market is categorized into mammography, ultrasound, MRI, and others (PET and thermography). In this market, the ultrasound segment is expected to be the fastest-growing segment owing to the increasing demand for minimally invasive and non-radiation breast biopsy among patients and surgeons. On the basis of product, the market is classified into biopsy needles, guidance systems, biopsy tables, localization wires, and others (markers, punches, sutures). The growth of the segment can be attributed to the increasing demand for needle biopsies such as core-needle and vacuum-assisted biopsy globally. Geographically, the market is dominated by North America, followed by Europe. The market in Asia-Pacific is expected to grow at the highest CAGR during the forecast period. Its high growth can be attributed to the rise in the purchasing power of the middle class and increasing awareness about breast cancer screening. Key players operating in the global market are Becton, Dickinson and Company (U.S.), C.R. Bard, Inc. (U.S.), Devicor Medical Products Inc. (U.S.), and Hologic Inc. (U.S.). 5.3.1.3 New Reimbursement Guidelines for Breast Biopsy Procedures in the U.S.
11.4 Devicor Medical Products Inc.
12.3.1 Devicor Medical Products Inc.